The following video discusses the Briarlake Forest in relation to the Georgia Conservancy’s 2006 study of LaVista Road sponsored by DeKalb County. This entry was posted in Uncategorized on January 30, 2015 by Laurie Marion. Signs have been posted on Amberwood Drive and Briarlake Road announcing a public hearing on the sketch plat that has been submitted to the DeKalb County Department of Planning and Sustainability. The hearing is scheduled for Wednesday, February 11, at 6:30 p.m. in the Maloof Auditorium in Decatur. Paper copies of the sketch plat are available in boxes next to the signs. There is an opportunity for public comment at the Planning Commission hearing. 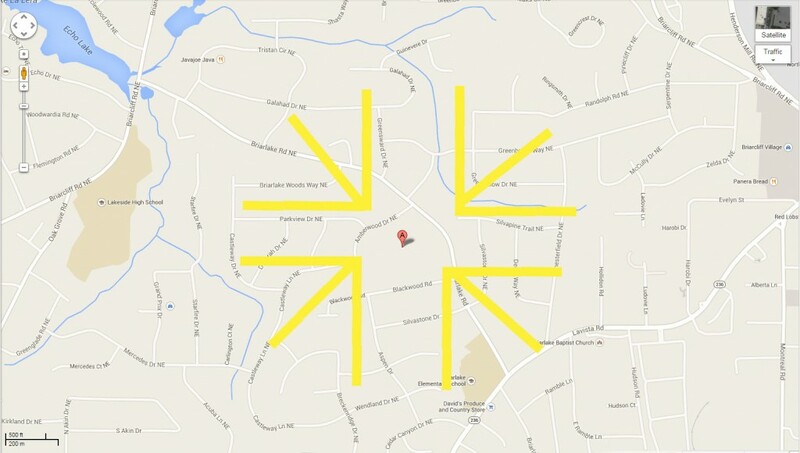 According to the DeKalb County Code (see (Ord. No. 30-02, Pt. II, 7-9-02; Ord. No. 01-04, Pt. I, 4-13-04), any person whose property line is within 1,500 feet of the property line of the proposed subdivision has the right to appeal decisions of the Planning Commission. This entry was posted in News on January 28, 2015 by Laurie Marion. 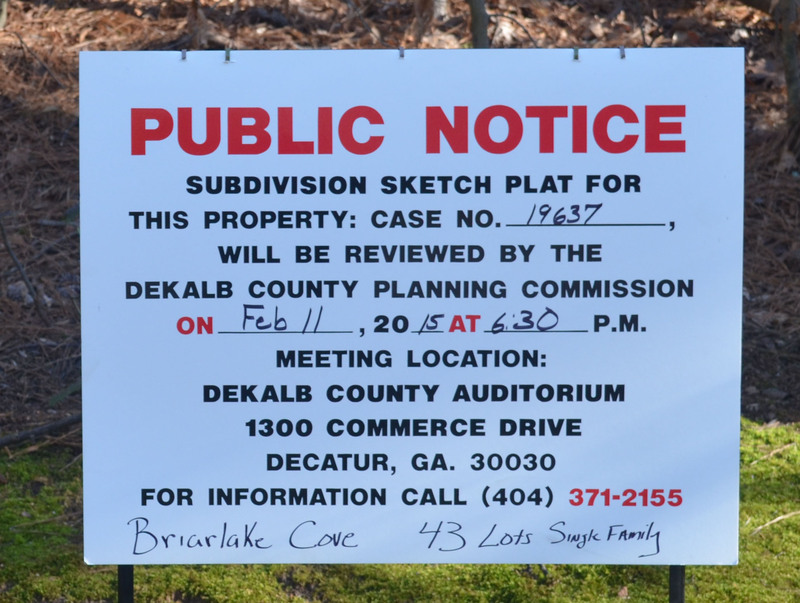 A new sketch plat was submitted to the DeKalb County Planning Department in late December by Arrowhead Real Estate Partners. The sketch plat shows plans for 43 lots that are a minimum of 15,000 square feet in area. The size of the lots varies; some are over 20,500 square feet. The sketch plat also shows two roads: one is an extension of Castleway Lane up the hill ending in a cul-de-sac, and the other extends inward from Amberwood Drive to the extended Castleway Lane, starting about 300 feet from the Amberwood entrance on Briarlake Road, essentially bisecting the main tract north to south. In addition to the lots and roads, the sketch plat includes three stormwater management facilities: one large one at the intersection of Parkview Drive and Amberwood Drive, a smaller one at the end of Silvapine Trail, and the smallest one at the intersection of Amberwood Drive and Castleway Lane. Sketch plats are reviewed by the Planning Commission after comment by various county departments. Once these comments are received, the Planning Commission holds a regularly scheduled public hearing to allow public comment on the sketch plat. The timing of the submission of the sketch plat suggests that it might appear on the agenda for the hearing scheduled on January 28 at the Manuel Maloof Auditorium. Stay tuned for further details. 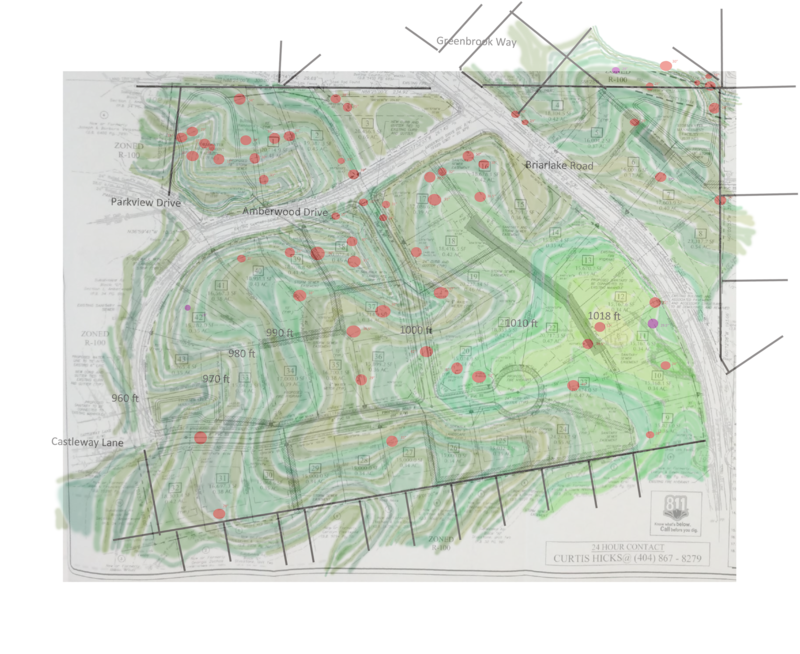 Below is a rendering of the sketch plat with the topographic map showing the specimen trees on the property overlaid onto the plat. If the plans indicated in this plat were in fact executed, over half of the specimen trees would be destroyed just to make space for the houses, roads and stormwater management facilities. It is not clear that this development would result in a net gain for the county, for the local community, or for the communities along the watershed. 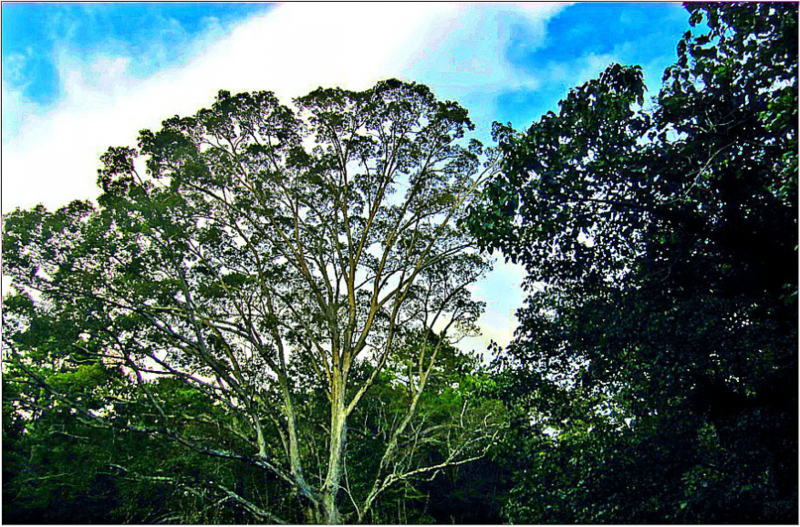 Old-growth trees provide substantial environmental benefits that are recognized by the U.S. government as having economic value. The sixty specimen trees on this property clean our air, cool the air in summer, conserve soil and water, and add beauty to the neighborhoods. They contribute to the physical, mental and emotional well-being of residents in the area. Without them, the people who currently live in the surrounding neighborhoods would experience a significant loss in quality of life. A meaningful connection with nature would be destroyed. Research shows that children who experience a healthy connection with the natural environment perform better at school, learn more easily, and achieve better emotional balance than those who have little opportunity to interact with a diverse ecosystem. With two schools within walking distance, the Briarlake forest could be a resource for enhancing both learning and character development. This entry was posted in News on January 5, 2015 by Laurie Marion.